WILMORE, Ky. — Asbury University has acquired two valuable theological collections tied to its Wesleyan heritage that include works ranging from the mid-17th century through the late 19th century. The “Wesley Collection” documents the development of John Wesley, founder of the Methodist movement, as an author, theologian and evangelist as well as the rise of Methodism in 18th and 19th-century England. The “Macclesfield Collection” includes works that influenced Wesley’s education and offers a glimpse of the religious writings of the 17th and 18th-century Anglican church. The two collections comprise more than 1,200 volumes, some of which include multiple titles bound together. "The value of these collections to the University far exceeds their actual cash value — though that is no doubt substantial,” said Asbury University Provost Jon Kulaga. “However, to have such a large collection of rare — and in some cases one-of-a-kind books — tied directly to our Wesleyan theological heritage will have a lasting positive impact on the scholarship of Asbury faculty and students for years to come." 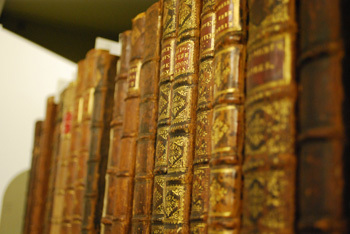 In the time the collections were housed at Asbury — prior to their now being permanently gifted to the University — scholars from around the world have interacted with the materials both during conferences (such as the Wesley Studies Summer Seminar hosted by Asbury Theological Seminary) as well as individual students working on research. A bibliography of the Wesley Collection is available online through Archives’ Special Collections. Anyone wishing to access the resources can visit the Archives Department in Kinlaw Library on weekdays from 1 to 5 p.m. or by calling (859) 858-3511 x2292 for an appointment.